Burette - Glass 100mL w/ PTFE Stopcock by VeeGee at Dupen Labs. MPN: 2420-100. Hurry! Limited time offer. Offer valid only while supplies last. 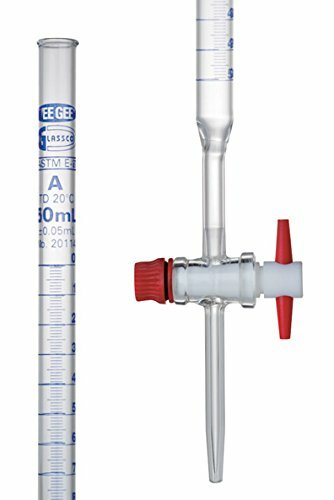 Burette - Glass 100mL w/ PTFE Stopcock, Made from precision, uniform Schott DURAN true-bore tubing to ensure the stipulated capacity tolerances. View More In Schellbach Burettes. Manufacturer: Vee Gee Scientific Inc. Publisher: Vee Gee Scientific Inc. Studio: Vee Gee Scientific Inc. If you have any questions about this product by VeeGee, contact us by completing and submitting the form below. If you are looking for a specif part number, please include it with your message.